Aliases: "The Dispatcher of Destiny", "Father", "The Gatekeeper to Posterity", "The Imparter of Immortality", "The Lamplighter of Legendary"
Powers/Abilities: Like most of the Elders of the Universe, Father Time was an immortal capable of manipulating cosmic energies for a variety of effects. Father Time could age others via touch, causing victims to grow old within seconds. He could also traverse throughout time. Using his scythe, Father Time could cut the fabric of reality to open a doorway to the Land of Legends. At some point, Father Time utilized a large spaceship and possessed the golden Events Book, a book in which the entire history of what had happened and what will happen was written. History: (Captain America I#383 (fb) – BTS) – An Elder of the Universe, Father Time became obsessed with commemorating significant events. Over time, he focused on American heroes, whether real or fictional. Traveling through time, Father Time pulled American heroes Johnny Appleseed, John Henry and Pecos Bill from their own time periods and brought them to the Land of Legends, a world that altered itself at its occupants' will. Killing the heroes so that their spirits could live on within the Land of Legends, Father Time also somehow brought representations of the thought-to-be-fictional Uncle Sam and Paul Bunyan to the Land of Legends. (Strange Tales I#115/2 (fb) - BTS) - Father Time took notice of Professor Thomas Benton's temporal experiments while building a Time Machine. (Strange Tales I#115/2 - BTS) - After Professor Thomas Benton designed a Time Machine and invited reporter John Pearson, the only reporter who had written a favorable report about Benton, to his laboratory on Mt. Raleigh to witness the Time Machine's first test, the two were transported to Father Time's spaceship by the Time Machine. Dressed in a white gown and possessing a near-floor length white beard, Father Time on how he had been in the midst of reviewing time events throughout history when Benton and Pearson popped into his spaceship. Claiming they were traveling the absolute zero of time, an interval point between the past and the future, Father Time admitted he had watching Benton's experiments and wanted Benton to fail as Benton had no right in Father Time's domain. When Benton seemed to ignore Father Time's protests and spoke to Pearson about testifying about his Time Machine's success upon their return to Earth, Father Time corrected Benton, explaining that they could never return to Earth from the absolute zero of time and suggesting they make themselves comfortable, as they would be remain outside of time as Father Time's guests for infinity. Pearson pleaded with Father Time, asking to be returned to Earth to meet up with Helen Randlings, a girl he hoped to someday marry, and Father Time smiled, suggesting that since Benton and Pearson got themselves there, they could get their own selves back. Still happy that his Time Machine had successfully worked, Benton apologized for appearing uninvited into Father Time's realm and Father Time decided to check Benton and Pearson's status in his Events Book, in which was written the entirety of history. Claiming that neither Benton nor Pearson for even in the Events Book due to their current nature of existence outside of time, Father Time began to think of how to get Pearson and Benton back to Earth to resume their lives and places in his Events Book. Pearson soon noticed a strange clock with only zeros on it and suggested that since they had fallen down into the Time Machine to arrive at the absolute zero of time, perhaps falling down while holding the strange clock might return them to Earth and before Father Time could respond, Pearson and Benton grabbed the clock and fell back into their chairs. Following an acrid cloud of smoke and a bright flash, Benton and Pearson found themselves back in Benton's lab surrounded by people who informed them that a bolt of lightning had hit the lab and shocked them, but Pearson soon realized that while he was indeed back on Earth, he was still holding Father's Time strange zero clock. (Captain America I#383) – Learning of Captain America's anniversary as an American icon, Father Time ran amuck in New York's Bowery to draw Captain America out. Investigating the disturbance, Captain America found Father Time and hurled his shield at the Elder, who opened a portal to the Land of Legends that swallowed the shield. Bidding Cap to follow him, Father Time entered the Land of Legends and Captain America followed shortly thereafter to retrieve his shield. After meeting many of the American legends that Father Time had brought there, Cap told Uncle Sam that his time on Earth was not over. Father Time then appeared and goaded Cap into a battle, pretending to lose his scythe. Father Time then leapt off a cliff toward his scythe, prompting Cap to grab him, thereby allowing Father Time to begin aging Cap in an attempt to kill him so that his spirit could reside in the Land of Legends. When Cap continued to fight against Father Time despite his severe aging, Father Time relented and returned Cap to Earth. (Contest of Champions I#6 (fb)) - Following the destruction and subsequent restoration of the multiverse, Father Time accompanied the other Elders of the Universe to the remnants of Doctor Doom's Battleworld patchwork planet, where the Collector confirmed the multiverse's recent situation. When the Runner tried to hurry the Collector into revealing why he had summoned the Elders of the Universe together, Gardener told the Runner to have patience, reminding him to stop and smell the roses. Father Time interjected, exclaiming that the clock was always ticking. Explorer sensed the riches to be had on Battleworld and Trader soon confirmed that a new omniverse meant a fresh supply of the energy of creation. When the Elders erupted into an argument, each suggesting settling what to do with the power primordial using their own obsessions, Grandmaster naturally suggested they play a Contest of Champions to decide which Elder of the Universe should inherit the creation energies. A recovering Maestro from Battleworld's Dystopia region weakly exclaimed that he would kill them all and Father Time watched with the other Elders as the Collector chose Maestro as his champion. Comments: Legend originated by unidentified creators. Adapted into Marvel Comics by unidentified creators and later fleshed out and revealed as an Elder of the Universe by Mark Gruenwald, Ron Lim and Danny Bulanadi. There was an old man named Father Time who aided the Blonde Phantom during the 1940s. 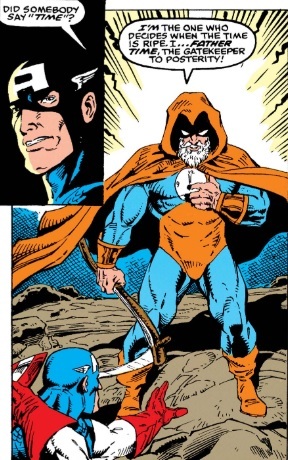 It’s very possible, given this Father Time’s nature as a time-traveling Elder of the Universe, that the Father Time who aided Blonde Phantom and the Father Time who attempted to force Captain America into the Land of Legends were the same character. There was no evidence to support that theory nor anything evidence to disprove it. Update 2/22/2019: The Father Time who appeared in Blonde Phantom I#22 was also called the Grim Reaper and was there to ensure the destined death of criminal George Caspelli. While this Father Time did possess white hair and a beard and could very well be the same character as the Elder of the Universe Father Time profiled here, it is also possible that this particular "Father Time" was actually some aspect of the cosmic entity Death. One might argue that the Elder of the Universe Father Time might also rescue souls from death (i.e. Johnny Appleseed, John Henry & Pecos Bill in Cap I#383), it seems unlikely that he would want to bring a wanted criminal to the Land of Legends...as such, they are likely not the same characters. In Contest of Champions I#6, we see several of the Elders of the Universe's champions being defeated, with 3 champions not identified with any Elder: multiversal versions of MODOK, Magik and Colossus. The Elders whose champions were not shown were Runner, Father Time, Gardener, Possessor, Explorer and Trader. Since no specific champion was shown to be associated with Father Time, I'd like to think that Father Time, being slightly more heroic than the other Elders and representing American legends, might have passed on the Grandmaster's contest and did not choose a champion, as he was never shown actually accepting Grandmaster's terms. Then again, he might've participated in an attempt to prevent a more villainous Elder from obtaining the power. Regardless, his champion, if any, was not revealed. I see no reason to think that the Father Time seen in the prose story in Strange Tales I#115 could not be this Father Time. Both possess white hair and beards and both traverse and watch over time. Since the Elder is known to especially watch over significant events, it seems to reason that he would be in his spaceship at the absolute zero of time when Prof. Benton and John Pearson popped there using Benton's Time Machine, as Father Time might have recognized that moment as a significant historical event. Plus, the Father Time in Strange Tales I#115 mentions his Events Book, in which was written the entirety of history. He did claim that Pearson and Benton were not present in the book at all but that claim could have been false and he could have foreseen their arrival using the Events Book and made it a point to be there to teach them a lesson in meddling with time.